The Los Angeles Metropolitan Transportation Authority's (Metro) Gateway Headquarters in downtown L.A. earned the U.S. Environmental Protection Agency's (EPA) prestigious Energy Star rating. Energy Star is the national symbol for protecting the environment through superior energy efficiency and signifies that a building is in the top 25 percent of similar facilities nationwide for energy efficiency. "While Metro's clean-burning fleet of trains and buses certainly is all about energy conservation, our overall goal is to apply that mindset to the entire agency, whether it is by carrying commuters who otherwise would drive or through new construction projects. 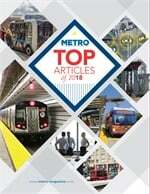 We want Metro to be sustainable from bottom to top," said Metro CEO Art Leahy. Metro earned the designation as part of a larger effort to attain a Leadership in Energy and Environmental Design (LEED) certification for Gateway Headquarters under the U.S. Green Building Council's Existing Building Operations and Maintenance (EBOM) category. Through the LEED-EBOM effort, Metro completed energy efficiency assessments, installed sub-meters, performed retro-commissioning activities and identified other energy saving measures. These activities were done in addition to previously completed energy saving efforts, which included installation of occupancy sensors, use of timers on the building's lighting systems and optimization of energy systems. Energy Star was introduced by EPA in 1992 as a voluntary effort to reduce greenhouse gas emissions through efficiency. For more information about the EPA Energy Star program, click here.